A Russian T-72 tank is unloaded prior to a rehearsal for the Victory Day military parade in St. Petersburg, Russia, April 28, 2016. Russian President Vladimir Putin has promised to sign off on a delivery of fighter jets, battle tanks and armored vehicles to Serbia, the Balkan country's defense minister said Tuesday, in what could worsen tensions with neighboring states and trigger an arms race in the war-weary region. Defense Minister Zoran Djordjevic said that Putin agreed to approve the delivery during a visit by Serbian Prime Minister Aleksandar Vucic to Moscow on Monday. He said six MiG-29 fighter jets, 30 T-72 tanks and 30 BRDM-2 armored vehicles will be delivered soon. The jets would have to fly over NATO-member countries before reaching Serbia. Or, they would have to be taken apart and flown in transport planes, if the neighboring countries approve. Djordjevic said earlier that Serbia is also interested in buying a Russian air defense system as well as opening a repair center for Russian MIL helicopters which, analysts believe, would be tantamount to opening a Russian military base on its territory. In this April 6, 2016 photo, ground crew stands on the tarmac by a MiG 21 fighter jet, near Belgrade, Serbia. Russian President Vladimir Putin has reportedly promised to sign off on a delivery of six MiG-29 fighter jets to Serbia. Serbia formally has been on the path to join the European Union, but under political and propaganda pressure from Moscow has steadily slid toward the Kremlin and its goal of keeping the countries in the Balkan region out of NATO and other Western integrations. EU officials have voiced their alarm over increasing Russian influence in the western Balkans, which has seen a bloody civil war in the 1990s. 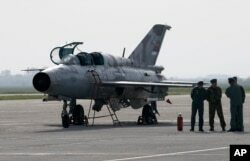 Meanwhile, Serbia's archrival and NATO-member Croatia is shopping for a new fighter to replace the nation's aging MiG-21s. The two leading contenders for the planned contract reportedly include American Lockheed Martin's F-16 and Swedish Saab JAS-39 Gripen. Which Will It Be for Montenegro: Toward West or Russia?